AREN’T THE MOST IMPORTANT THINGS IN YOUR LIFE CUSTOM MADE OR FITTED? EVO is the RR-asters n tail. onnq the correct model to your unique pool and Condit ones. EVO’s Custom V5 Iailored. The pool evaluation program is essential and removes the guesswork In you achieving the ultimate pool temperature all year round’EVO technology leads the world In energy savings and environmental responsibility. We care for our environment and use only zero depleuon rated R41Oa refrigerant. Evo IS registered under the Australian Government’s Ozon Protection and Synthetic Greenhouse Gas Act. 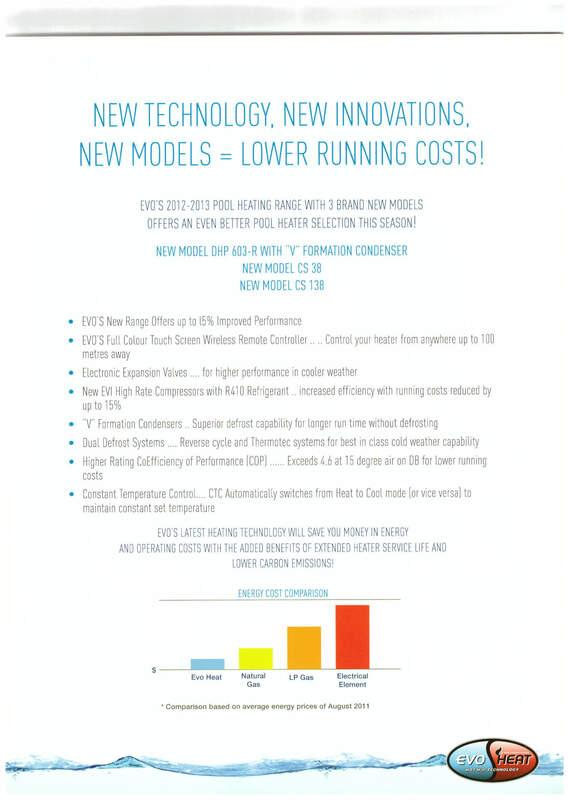 EVO’s engineers have developed the most advanced dual defrost systems Simply the best: In Its class for cold weather performance, which will save you thousands of dollars on your pool heating or cooling costs each year E heat pumps offer the most advanced and energy-efficient method of on-demand pool heating or chilling available. EVO heal pumps are up to 500% efficient. 1kw of electricity can generate In excess of 5kw of healing. Evoheat savings exceed $1500 a year on a 5000-litre spa running 24/7 when compared to gas. Evoheat savings exceed $6500 a year on an 80,OOO-litre pool at 30 degrees when compared to gas. Evoheat savings exceed $45,000 a year on an olympic pool at 27 degrees when compared to gas. Eva saves money on running costs and reduces your carbon emissions with $avings of ove 50% vs natural gas, and even greater on alternative energy sources.